I was hoping to be able to show you at least one finished thing today, but instead I’ll show you 3 unfinished thing. 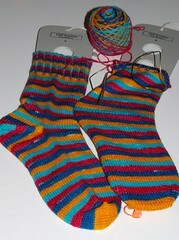 Up first are my Knitterly Things Vesper socks with afterthought heel. I’ve reached the cuff on the second sock and once that is done I’ll just have the heel to add and I’ll have a finished pair! 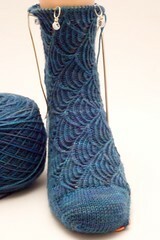 In second place is my Pomatomus sock. I really was hoping to have it done by today but didn’t get to knit on it much the last few days. I’ve only a few more rows left to knit before I start the ribbing. My fingers have been itching to sew a quick and easy quilt top and this weekend I finally had some time and I just started cutting and sewing. I just have to add a top and bottom border and the quilt top will be finished. I also have to piece the back but that can wait until after Stitches East! I also made sure to finish all these box bags that I’ll be bringing to Baltimore. Thank you all for your wonderful comments about my bags! Knitting will resume its pace once we get back from Stitches… I can’t wait! The quilt is just amazing! The colors are perfect together. 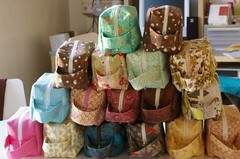 And the box bags make me want to go to Stitches just to buy one! Oh, your bags are awesome!!! 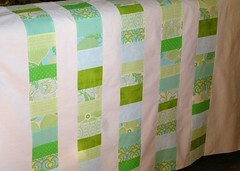 What fun aqua and green colors in y our coins quilt! The white makes it look very fresh. I hope the show is successful for you! The quilt looks great and so do the socks. Your not going to believe this but I had a dream last night about your bags. Funny huh! wowsa is that a swarm of bags! You’ve been one busy girl! beautiful quilt top, and socks in progress too!